Collectors frequently sell old Sinclair products on eBay.co.uk. Click the "GO" button on the left to find any Sinclair Microdrives being auctioned. The Microdrive was Sinclair's typically unconventional answer to the Spectrum owner's desire for a mass storage system. The then-standard 5.25" floppy disk drives were expensive, bulky items and, as with the ZX Printer, there was clearly a niche for a budget alternative. 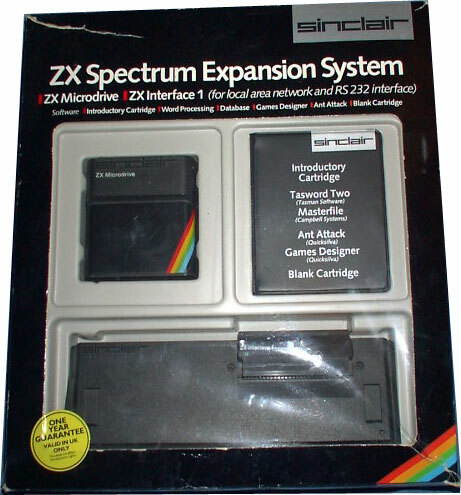 The device was launched in June 1983 for £49.95, or £79.95 when bought with the Interface 1 (without which the Microdrive could not be used); both were available in a special "ZX Spectrum Expansion System" package. Up to eight Microdrives could be connected side-by-side, daisy-chained to each other via a slot in the side of the device. It is remarkable that the Microdrive worked in the first place. 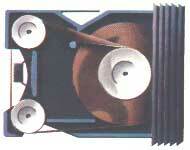 It relies on the "stringy floppy" principle - 6m of 1.9mm tape forms an endless loop inside each tiny cartridge (right, shown at actual size), running past the Microdive heads at 76cm per second. 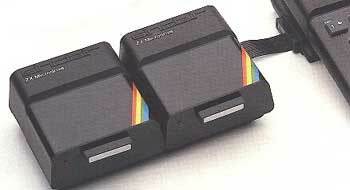 Up to 85K of data could be stored on a cartridge and retrieved at the rate of 15K per second. As with many other Sinclair products, the tolerances of the components were pushed to the limits to produce results beyond what might ordinarily have been expected. Unfortunately, again as with many other Sinclair products, this caused reliability problems. The cartridges were prone to tangling, had a short service life and suffered from compatibility problems between different Microdrives. On top of that, they were also difficult to manufacture and so were initially scarce and expensive at £4.95 each. Although the price of cartridges eventually fell, the Microdrive was virtually ignored by software manufacturers and very few bothered to support it. The public response was much more positive - the Microdrive sold so well that Sinclair was forced to limit the number of machines to two per applicant, which reduced (but did not eliminate) the familiar waiting lists. Sinclair also chose the Microdrive (in a slightly revised version, incompatible with the Spectrum Microdrive) to be the built-in mass storage device of the QL. When the price of conventional disk drives fell in the mid-1980s, although Amstrad bought the rights to the Microdrive it was abandoned - instead, Amstrad's own 3" disk format was used on the Spectrum +3.